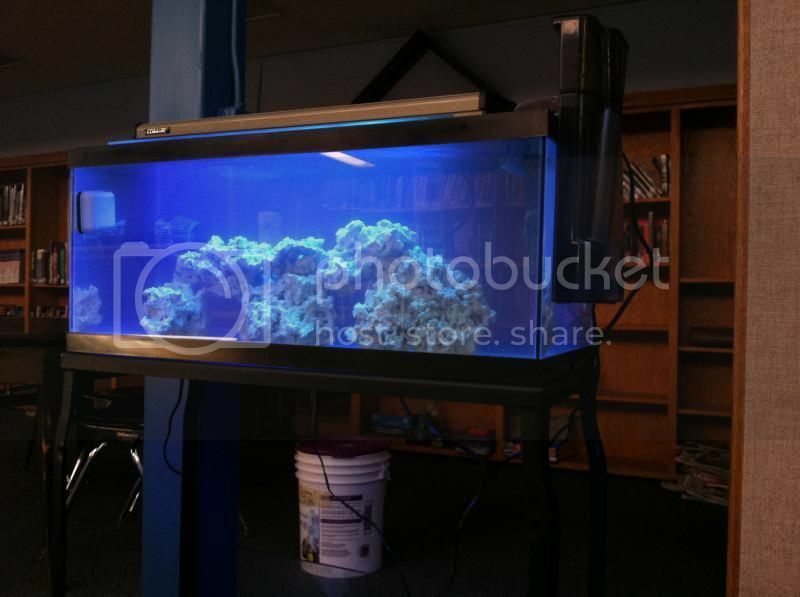 The idea of this thread is to establish a central location where people wishing to donate equipment, livestock, or time to help set-up/maintain marine aquariums can meet teachers that desire a tank in their classroom. Most reef keepers become hooked on the hobby due to the extremely fascinating and beautiful nature of reef habitats. Beyond the aesthetic pleasures, reefs can teach us a great deal about biology, ecology, chemistry, evolution, and many other fascinating scientific aspects. Providing teachers who wish to endeavor on keeping a reef in their classrooms with a means of doing so is a tremendous enrichment. Not only can a classroom reef delight and entertain, it can provide new opportunities for teaching examples, as well as fostering an appreciation of reef habitats in general. Ok, I have equipment/livestock/time I'd like to donate, who do I give them too? What do I do? I didnt notice this post before I made a trade offer tonight. If the trade is rejected, I have aprox 25-30 pounds of mined live rock from a tank im taking down as well as two ten gallon tanks and a 48in coralife PC light that would make me elated to donate. Walking the tide pools of california as a young boy was a daily staple of my life for many years, I would love to pass along a similar memory. 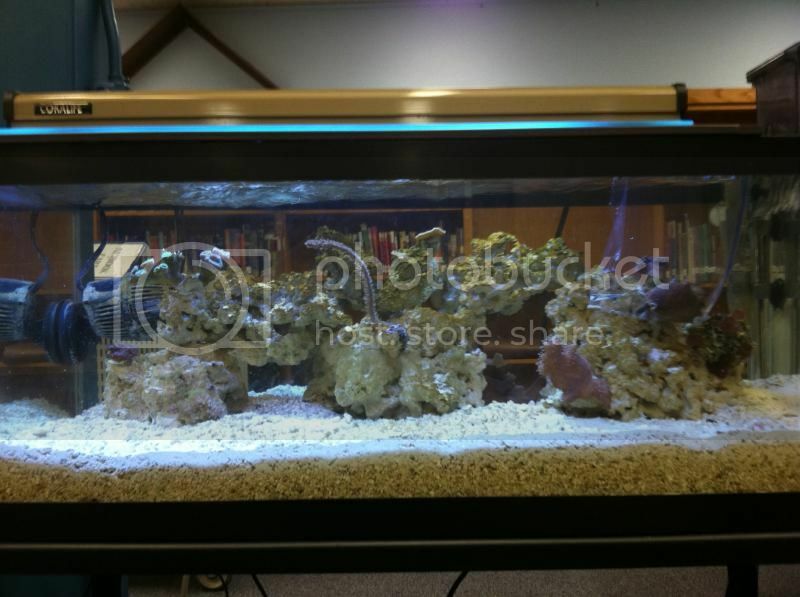 I am in the early stages of finding a teacher that wants to take care of our first MARS sponsored school reef tank! 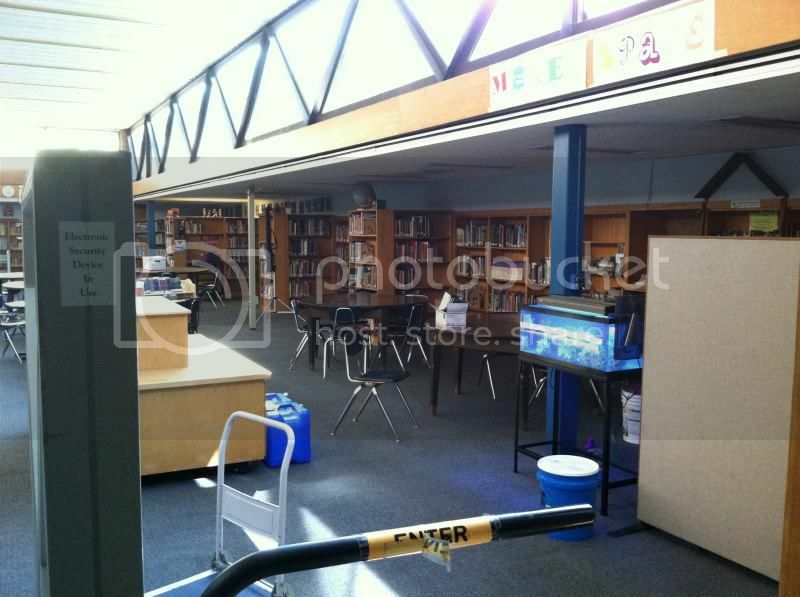 I have been working closely with the Madison Metropolitan School District to get the word out to teachers that would be interested in incorporating a reef tank into their teaching curriculum. We should start receiving applications from middle school teachers over the next 2 weeks and the plan is to set up a tank over the summer so it is ready by the start of school in the fall. So far several members have helped get the program started by donating a tank, some equipment, live rock, and even some corals! We still need a number of things in order to get a fully set-up system, so if anyone has anything else they would be interested in donating, please contact me. The plan at the moment is to get all the equipment we need from the community, and then I will get in touch with local fish stores to see about getting consumables (salt, test kits) and livestock (fish, inverts) donated to the project. I would gladly welcome these donations from community members as well, but am not currently able to accept livestock donations before the tank is up and running. I'll continue to post updates in this thread as things come along. Thank you so much to everyone that has helped the program so far, your generosity is greatly appreciated! Hi, I'm brand new to the forum due to meeting a member today and letting me know about this site. I have a 180g FWLR tank and my wife has a 120g FWLR. I work with the Madison Schools servicing their copier fleet. I'm curious which school has been selected if yet. I'm willing to help if I can in some way. As of yesterday, we have officially chosen and agreed to establish the first ever MARS school tank at O'Keefe Middle School in Madison!! 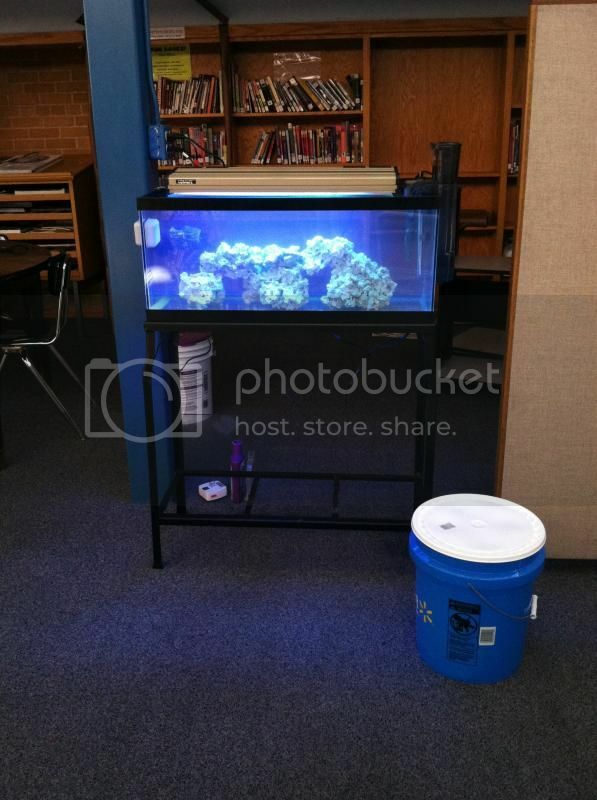 We received several applications from teachers that wanted a reef tank in their classrooms in order to add breadth and depth to the curriculum (in addition to having an awesome new hobby). In the end, the application from the two teachers at O'Keefe stood out from the others and we are excited to begin working with them to get the tank set-up in the next few months. I'd like to say thank you again to all the members that have helped through donations so far. I will continue to update this thread as the program progresses...and I will continue to ask for support from all you awesome MARS members! Yesterday I took all the equipment over to O'Keeffe middle school and got the tank running with freshly made saltwater and live rock. It still needs work, but I think it's a terrific start! I would also like to give a huge thank you and recognition to the people that have donated things that have made this possible. If you'd rather not have your name listed here, please just let me know and I'll take care of it. With that being said, there are still a few things I'm looking for that I was hoping other people in the club would be able to donate. I will be taking some corals over next week and continuing to make the tank is running smoothly. As long as all is well, I am planning on getting the fish (from the awesome folks at Animart) the following week. Hopefully by the time school starts everything will be settled and happy! Thanks again to everyone, I'll continue to update as things come along! In addition to the size issue on the Magfloat, I think that in a middle school the dry side of that thing is going to go AWOL within hours, and will be found stuck to the bottom of a desk in a math classroom. That's what the 7th grade me would do, anyway. I have a couple 5 gallon pails of clean, dry sand (Fiji Pink, if I recall), but it is way up here in the sticks (Oxford) and I'm not planning a trip to civilization for at least a few weeks. If you get up my way, though, you can have it and I'll throw in a couple hammer coral frags for the tank. Thanks for the offer on the sand and the frags too, I'll be in touch if I think I'll try heading out your way. Hey Nick, I have a bunch of sand I can contribute! Fish could go in next week! nice. love the rock formations. i just picked up my conch today haha. Is there any interest in getting another school tank going? I inadvertently inherited the two tanks at Middleton High School after the previous care giver retired, and now have a 55g and what looks like a 90g to figure out what to do with. Equipments more on the scarce side, so I know this is more of a long shot, but let me know if anyone has any interest in working towards getting another school tank going! The 90g is in a hallway display window and the 55g is in a biology classroom (currently is FW but I dont believe copper was ever used in either tank). Currently what I have for equipment is a 4x54w T5 setup with an icecap ballast, a CO2 tank, somewhere theres a tunze nanostream 6025, heaters, the basics essentially. i have a sump that i no longer need. are you interested in having one? ice fish wrote: i have a sump that i no longer need. are you interested in having one? Currently the plan is a go for a 120g reef tank in a display hallway! We have a 2x250w MH fixture to go on it with 14k bulbs, some nice powerheads, lots of kits and other things. Were nearly to the point of getting the tank up and going, we even have a skimmer ready to go!!! Mainly trying to make sure we have everything to do it right, I have the largest aquaclear filter which will either be on the sump or turned into a small fuge with mangroves or something of the like. Thanks so much to everyone who has found us some equipment so far!! This is a great way to get the student body interested in the hobby since its going right in a main hallway near an entrance to the biology/chemistry wing! One goal I have for the future with this tank is to get some useful information about reef ecosystems and the processes involved printed out nicely (I can print it and laminate) to explain the function of different filtration equipment and other portions of the tank. I dont have a bio background (I teach physics and engineering) so someone who is really into reef chemistry writing up something would be an awesome way to help kids make the connection between classroom topics and the equipment they see. Id like to get these printed and attached to the visible equipment. Once things get going further getting some livestock in the tank would be increadible, I have some small frags to bring in but simple corals would be great, my goal is to not get into SPS with this tank since going softy/lps will keep maintenance simple and costs down. Last edited by Longinus on Wed Sep 10, 2014 2:24 pm, edited 1 time in total. Updated what we need portion, I made a repost in the Buy/Sell forum since more people stop through there.